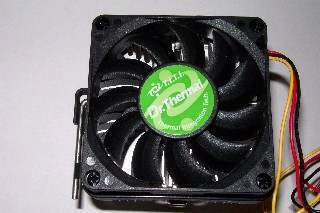 We have another new comer on the cooling scene by the name of Thermal Integration or TI for short. 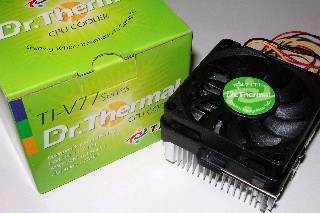 They have released a unit label the TI-V77L cooler, which kind of resembles the ThermoEngine we reviewed a while back. Although similar, the use of the unit is not the same. Let us take a look at what we are up against. The first impression is the bright box, nice packaging for once. Thank god they decided to use something other than white! The TI-V77 measures at 94X74.5X47.2mm, not exactly the biggest heatsink out there but nicely sized. This should fit fine on most boards. The ball bearing fan runs at 5000rpms pumping out 38CFMs at a noise level of 42.5dBA. 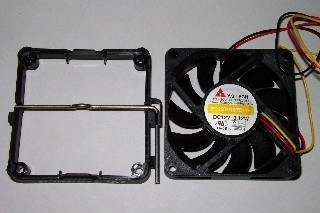 The 70X70X15 fan can be replaced and if used with a 60mm adapter, 60mm fans can be used to cool the unit. 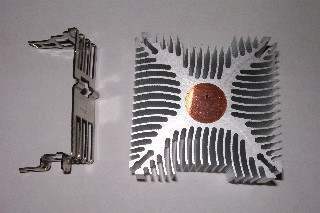 There are two more models (K and N) versions of the heatsink, only difference being the height of the fan (10 and 25 respectively). 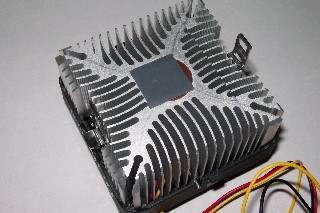 It is "Designed for Overclocking" for all Intel PIII 1.13Ghz+ and AMD Athlon 1.5Ghz+ CPUs as stated on the box. The first item that stands out is the bar on the side of the unit. Upon lifting it, it releases the clips so you can slide them onto your socket tabs. Pushing them back down locks it down. Extremely easy installation, no tools needed at all! Here is a side shot of the clip, no screwdriver notch finally! 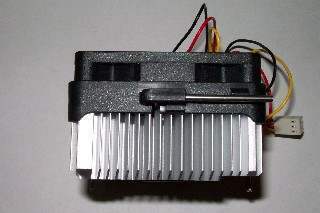 They call this the "E-System Attachment" portion of the heatsink. The base of the unit has that nasty phase changing thermal pad, we removed that of course and applied ASII thermal grease. 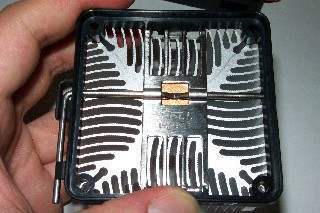 The core of the heatsink is made entirely of copper. Not the first time we've seen this design, the ThermoEngine was the first unit I saw which had this on their product. TI calls this the "Radi-Gear" Form design. The above two pictures show the basic workings of the lever. 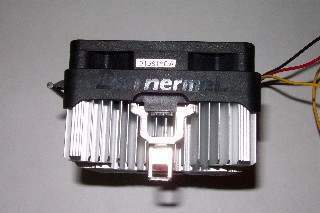 There is a raised notch in the middle of the one piece lever and when it is raised, the notch lies flat releasing the clips. 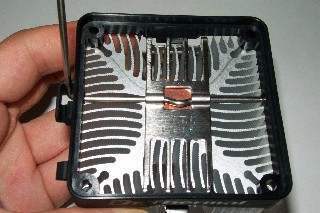 Once pushed down, the clips are lifted up due to the notches. Easy concept put to good use. Even with its super cool lever, this unit does not exactly surpass the big boys. The unit is adequate, don't get us wrong. Pit this against a regular OEM cooler and we'll take this one 10 times out of 10. Add the 70X70X25mm to the unit does help it a bit with its 46CFMs. 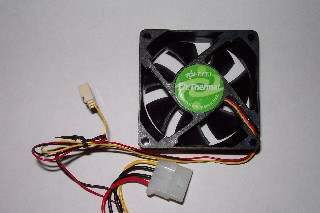 If you add the faster fan, you'll be creating the TI-V77N version of the unit. They designated different model numbers due to fan speeds, N being the fastest. The temperatures shown are at overclocked speeds, normal stock CPUs should work nicely with this. One thing I did notice at the end, was when removing the unit the thermal paste was slightly off centered on the copper middle. Not all of the CPU core was in the copper center, a tiny portion was off. Not a big deal as I am going to assume such a small area would only cause miniscule changes in the temperature at best. Thanks to Thermal Integration for sending us this test sample. Always a pleasure to check out new units. Keep an eye out for this model, it should be around the $20-$25 range at your favorite local e-tailer.